Ensuring a tungsten electrode is sharpened correctly can help to improve weld quality. Tungsten electrode grinders are a convenient, safer and more accurate way than other methods of grinding tungsten electrodes. Back by popular demand, Huntingdon Fusion Techniques HFT® have re-initiated the manufacturing of the TEG-2 Tungsten Electrode Grinder, which was retired from their product range a number of years ago. It has an updated design with a number of improvements and the model name is now the TEG-1000. The use of the TEG-1000 Grinder will give repeatable tungsten electrode points every time, enabling consistent repeatable arc performance and welding results. Diameters 1.0 to 3.2 mm can be ground as standard, with other sizes catered for with standard accessories available as extras. TIG welding requires tungsten electrodes to have perfectly ground and polished tips. HFT®’s TEG-1000 provides these, time after time, to exactly the same size and shape. 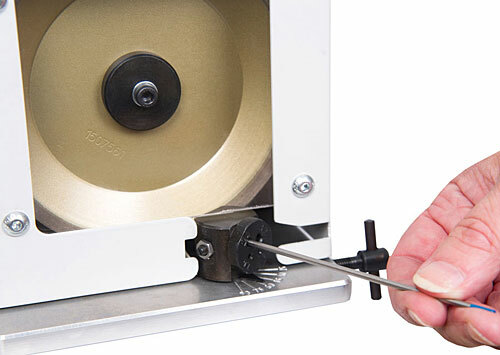 The diamond wheel grinds the Tungsten Electrodes longitudinally, preventing arc flicker or wander caused by circumferential lines or ridges found on electrodes, which have been ground incorrectly.